A beautiful photo calendar is an excellent gift for many occasions, and therefore an additional profit source for your photography business. Offer your clients a new service - designing custom calendars with their own photos! Photo Calendar Creator will help you here. This worldwide popular application allows you to make calendars of any type: 12-page annual calendars, wall, desk, pocket calendars, and planners. You can also make promotional calendars for your corporate clients as well as for your own photography business. The program has a rich feature set that's sure to surprise you. There is a huge selection of ready-made design templates, month grid styles, and calendar backgrounds. 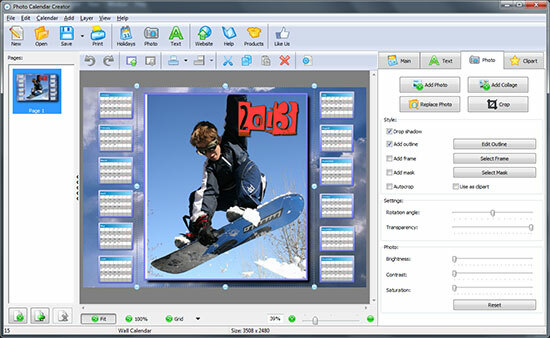 You will also find everything you need to play with photos: crop and enhancement tools, rotation and transparency, masks and frames collections. Another cool feature is grid collage creation. Drag-and drop interface and easy work with layers turn designing calendars into a pleasure. The app is multi-language and has holiday sets for different countries. The program can print calendars of any size in premium quality. Calendars can be saved in common image formats, PDF, or TIFF (CMYK). You can also save your own design templates if you wish to use them again in the future.